Preheat the oven to 180. Sift all dry ingredients and set aside. Melt the chocolate and coconut oil in a double boiler over medium heat or in a microwave and then stir in the sugar. Whisk the egg, milk and chocolate mixture in a large bowl. Add the dry ingredients into the wet ingredients. Fold to combine until smooth. Transfer to a prepared pan, drop little globs of peanut butter and swirl with a knife. Bake in the preheated oven for 20-25 minutes. Allow the brownies to cool in the pan before cutting. 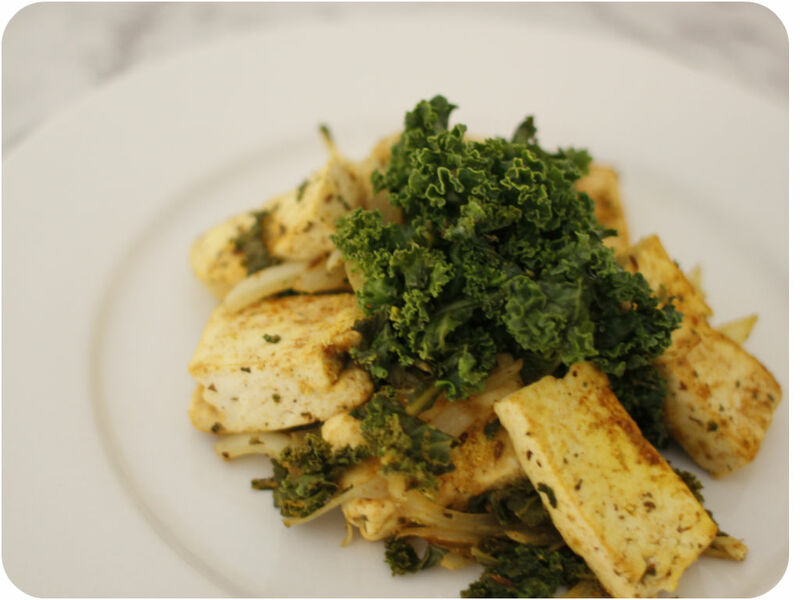 Tips for cooking with firm tofu! When you scramble or stir-fry or grill your tofu, having it pressed before cooking prevents too much water coming out and brings out more texture and flavour. Place the slices of firm tofu on top of kitchen towel and another paper towel on top. Put a heavy object like a plate or book on top of that for about 30 minutes while you are preparing other ingredients. After that, you can marinade or add spices to it. Press the tofu as above. Cook garlic and onion with coconut oil in a pan over medium heat. You can stir in any kind of vegetables here, mushrooms, capsicum, broccoli, tomato, etc. Add diced firm tofu and spices. Stir and cook for about 5 minutes until all ingredients are mixed together. You can smudge the tofu with the back of the wooden spoon to make more scramble, but I left them intact. Add salt and pepper to taste. Transfer to the plate and top with fresh kale or herbs. I’ve written about red rice before. Today it is black wild rice (forbidden rice). According to Chinese sources, the name “Forbidden Rice” came from the fact that it was eaten only by royalty likely comes from the term 御稻 (yù dào) or imperial rice. First of all, here is nutrition information of the different rice colours. Purple rice – 8.3 protein, 3.9 iron, 2.2 zinc and 1.4 fiber. It is well-known that brown rice is a healthier alternative to white. The difference between the two is that white rice is devoid of bran, which is full of vitamins, minerals and antioxidants. Like brown rice, black rice has similar nutrient levels and higher amounts of antioxidants. It is also a source of fiber and minerals, including iron. 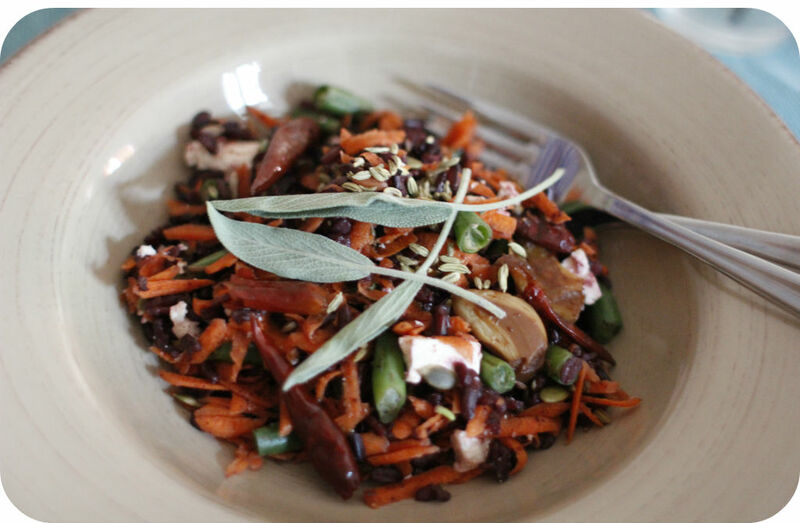 A 100 gram serving of black rice has 8.5 grams of protein, 3.5 milligrams of iron and 4.9 grams of fiber. Compared to white, brown and red rices, black rice has the highest amount of protein and double the fiber of brown rice. 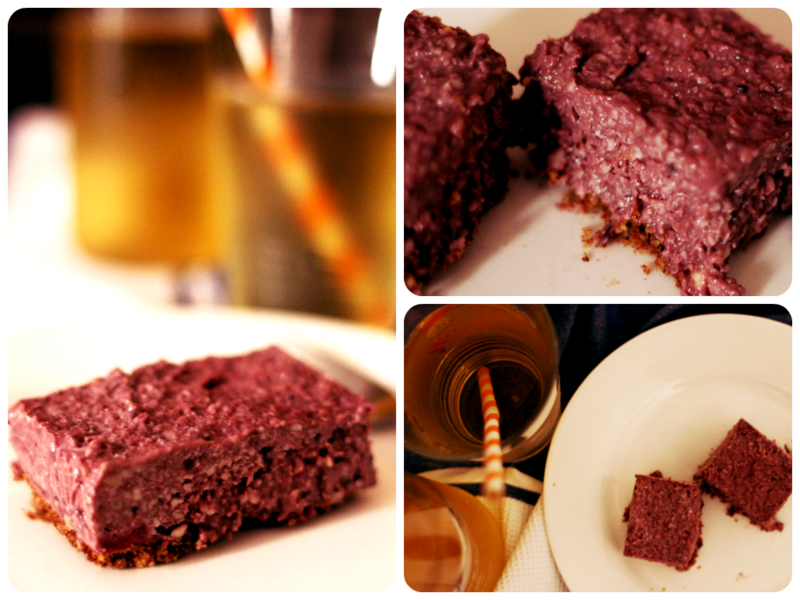 Black rice turns a deep purple when cooked and is packed with anthocyanins. Anthocyanins are phytochemicals found in deep blue and purple foods, which are thought to fight chronic disease such as cancer and heart disease. Another kind of antioxidant found in black rice bran is thought to be responsible for lowering bad cholesterol levels, helping prevent heart disease. 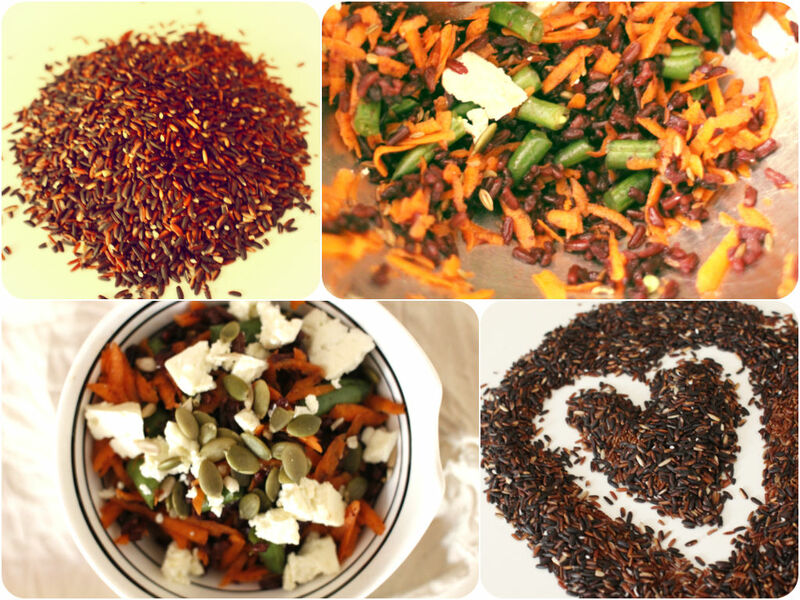 My mum used to cook wild rice with white and brown rice since the coloured rice can be quite tough and hard to digest for kids or if you are not used to it. So I recommend doing the same if you are the first timer cooking wild rice. I cook it in the same way as other rice but with more water for a little longer. Bring one cup of wild rice and three cups of water to the boil and then simmer on low heat for 40 minutes. Stir occasionally making sure it doesn’t burn at the bottom. My tip is once the rice is cooked, turn off the heat and then leave it for 5-10 minutes with a lid on. I find this process makes the rice moist and fluffy. You can make nice rice salads, pilaf, paella, sushi rolls, rice pudding, soup, baked rice casserole, etc. Choice is yours! As per my previous post, it is better to soak your nuts for your digestion. 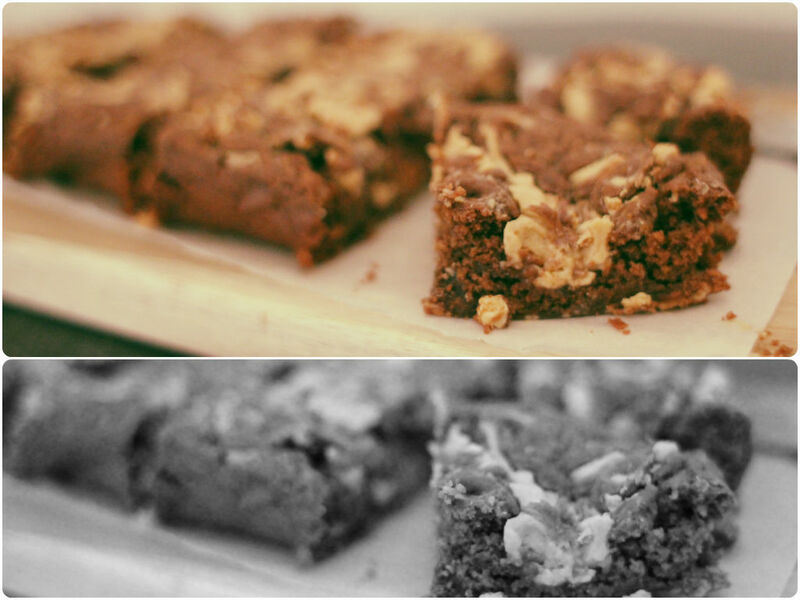 I find an easy way is making a nut-based “cheese” cake and enjoying a slice a day to have your daily nut intake. They are absolutely raw, pre-soaked and blended for you with a pack of flavour. Make this cake (about 6-7 servings) on the weekend and enjoy for a week. So easy! Believe or not, I’ve never ordered ravioli or any other pasta dishes at Italian restaurant. I remember when I went out with work people for Christmas party a few years ago. We all went to this very popular Italian restaurant in town. Well some people ordered pizza, pasta, lasagna, you know all the traditional Italian foods. I ordered a bowl of salad (a safe option for being gluten-sensitive) and Daniel ordered a steak. Everyone laughed at us not ordering any Italian foods at Italian restaurant. I still don’t order those although they offer a gluten-free option. It tastes quite heavy to me. When I was browsing some food blogs, I came across this blog called “Dolly and Oatmeal” based in NY. Her blog has beautiful photographs and simple recipes that I fell in love. This ravioli is inspired by her. You should all have some leftover rice papers in your pantry. Well I do! If you don’t, you can get them from any Asian groceries or in the Asian food aisle at the local supermarket. Handling rice papers can be a little bit tricky because it gets sticky and messy when you dip it in water too long. So you might need to play with it and practice until you get the hang of it. I like making rice paper rolls using fresh crisp vegetables and now making this gluten free ravioli! You can put any kind of fillings such as pesto, cheese, tofu, etc. I had a jar of chilli-capsicum chutney made up in the fridge, so decided to try with it. 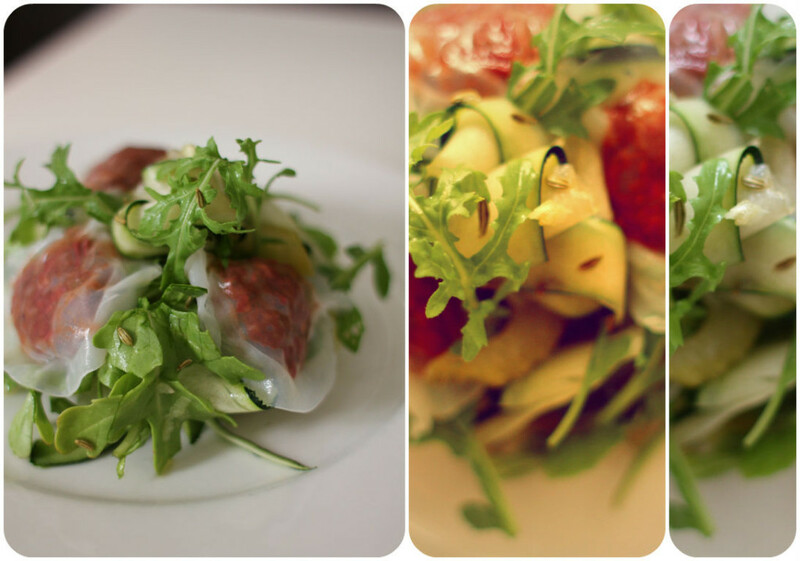 The bright red colour actually went so well with the green zucchini salad. Dip the rice paper in water until soft and set it on the plate. Put dollops of chutney fillings on the rice paper. 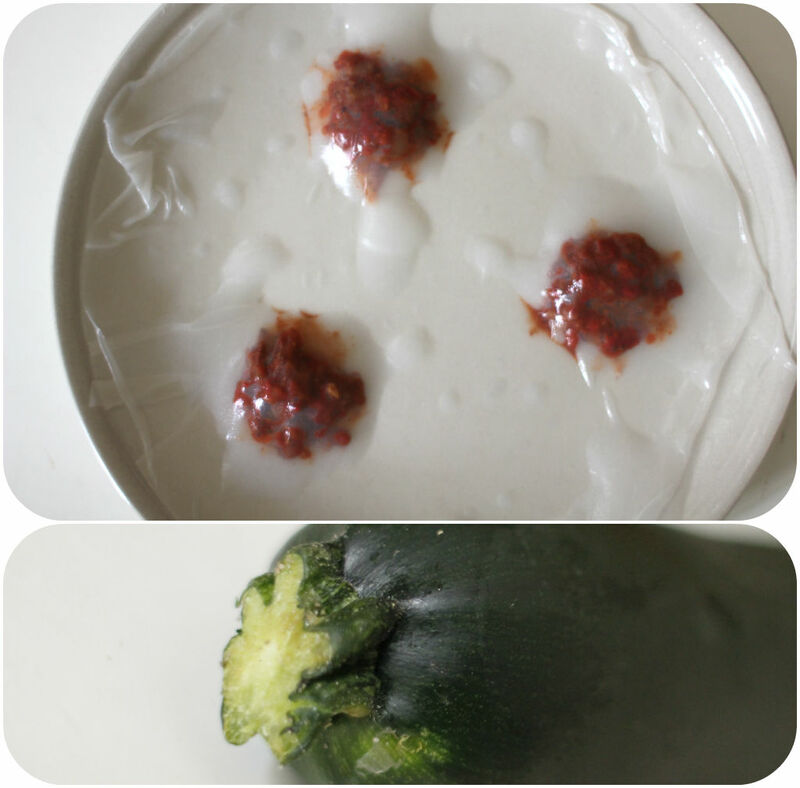 Dip the second piece of rice paper in water and then put it over the bottom piece. Get rid of air bubbles using a knife to make little cuts and create a seal around the filling. You might want to use a bit of oil in your finger to handle the rice papers since it can be quite sticky. Use a cookie cutter or a sharp knife to cut the ravioli. For the salad, I simply mixed ribboned zucchini, sliced celery, arugula leaves and fennel seeds. Then tossed with the maple vinaigrette. A beautiful fresh summer salad! You can make this to impress your loved ones or it is a perfect entree on a special day.